Is Epic's Relationship with Save the World Players Really Beyond Saving? Things aren't great on the other side of the coin. When your game's only community liaison throws up their hands, where do you go from there? The mood in /r/Fortnite is tense right now. A significant portion of the Save the World subreddit's new posts are expressions of exasperation, frustration, anger, or all of the above. Players feel forgotten; underserved; unappreciated. And, for their part, Epic's sole representation on the forum is projecting an aura of perfunctory amicability -- the sort of "let's just get through this" attitude normally reserved for group projects in undergrad, or phone calls about divorce paperwork. The subreddit's issues with Save the World -- or more accurately, Epic's handling of Save the World -- are as numerous as its users, but the most pervasive sentiment is one of neglect. Players see matchmaking bugs and broken items in Battle Royale handled almost immediately, while similar issues in Save the World go unresolved for months at a time. Players see Battle Royale receive extensive map updates, new gameplay modes, and new skins/cosmetics multiple times over a period of mere weeks, while Save the World waits months at a time for anything that isn't a hand-me-down from the other mode. Some players even feel that Battle Royale, a mode that supposedly focuses on gameplay first, has a far more interesting and cultivated story than Save the World, specifically with regards to the summer's rift event, and all the recent happenings with Kevin the Cube. Most recently, Fortnitemares also highlighted the perceived rift between games with its addition of "Cube Monsters" to Battle Royale. 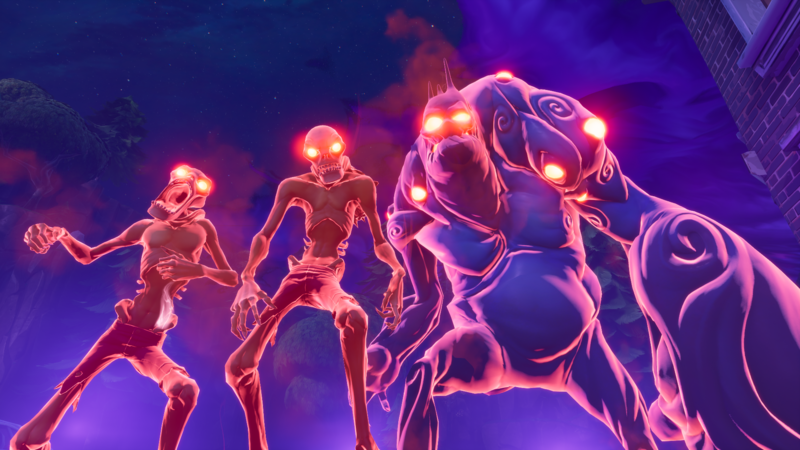 The mode's first PvE enemies, Cube Monsters are essentially updated, better looking versions of the enemies in Save the World. Sure, Save the World has received variations of its existing enemies over time, but never anything more dramatic than "the old monster but with a hat," or "the old monsters but with a fridge door." So now, not only does Battle Royale get the costumes first, and the items, and the modes, and the map changes, it also gets the first real new enemies in arguably a year. The disparity can even be felt in the way Epic handles its patch notes -- seasonal Battle Royale events such as High Stakes and Fortnitemares get flashy, high-production cinematics, and even new items and modes get their own trailers. In contrast, new additions to Save the World are lucky to even receive a screenshot, let alone Epic's loving video treatment. "I know it can be frustrating to only hear negative feedback, but that's what happens when you have a community that adores your game but receives little to no communication. The same goes when we are promised 'big things are coming' and then we are given recycled or drip fed content," Reddit user u/AntoniusBIG said in a post. "During your roadmap at the end of this week I would highly suggest you answer a LOT of the questions people have been asking, and show us some working products you have developed. If we are told again that big things are coming and don't actually show us a sneak peek at these 'big things,' you'll only have a continued cycle of negative feedback." In response, Epic's Save the World community liaison u/Magyst said that "everyone needs to get the idea that 'STW will shut down' out of their heads," addressing the overall sentiment of the subreddit, though not the specific content of the post. "We love STW and are working on some cool new features to finish out the rest of 2018. Each of the features will have detailed write ups to accompany them. Bear in mind, we will not disclose our entire plans because things are always subject to change due to numerous reasons (last minute bugs, art, code, etc)." "The thought that StW is going to shut down has never crossed my mind," u/AntoniusBIG said in response. "I simply desire for this constant negative feedback loop to break, so that way we can go back to the wonderful relationship we shared with you folks at Epic a while back." "Sadly, I fear that this will never happen," u/Magyst replied. "I could literally tell everyone what would be coming down the pipeline.. but players would still find something to pick apart and vent about. This has been proven time and time again, regardless of what gets released. I will continue to work with the dev team on bringing back the design chats and roadmaps. We're currently putting together a write up for a new feature that will be coming very soon." It's astonishing to see a game's only community representative say that its relationship with the players might be beyond repair. At first glance, it even looks like u/Magyst is placing the blame on the community, saying that /r/Fortnite's temper has degraded to such a point as to be unquellable. It's also possible that u/Magyst is calling out what's "coming down the pipeline" as the culprit, implying that players will be unhappy with Save the World's content when compared to Battle Royale's, no matter how transparent development is. We think that the Save the World community's relationship with Epic can be saved, but not without significant effort from Epic to do so. Awkward dev roadmap videos and vague posts about "great things on the horizon" aren't going to be enough to pull this out of the fire. At the end of the day, Save the World players just want to feel special again, and you can achieve that by giving them the same attention you give Battle Royale. There are a hundred different legitimate business reasons why Battle Royale takes development priority over Save the World, but there's no reason why it should also take emotional priority. If Save the World has to eat leftovers, for whatever reason, at least act excited about it. Don't just throw the half-empty pizza box on the floor and say "there, I fed you."